"I was absolutely amazed at the craftmenship and professional attitudes of the everyone involved. The awning they built was spot on, so I had them build my shed. The jobs were handled from start to finished by Garage World, I didnt have to lift a finger." "I chose Garage World due to the professionalism I encountered at their display office and the obvious competence of the staff that attended me. My choice proved correct as the job went smoothly from concept to completion, with Garage World organising the building approval, concreters, builders and final inspection just in time for my birthday. Garage World are a safe option and I'd use them again in a heartbeat." "Thank you for all your help and making the whole process easy. The guys were always going the extra step, which made the build a positive experience for us. We all love the 'Shedquarters' as the kids call it." "They asked how big I wanted my shed, and they built it to fit." "My sister and my friend both got sheds from other builders and they can't believe how good the quality is compared to theirs. We are so happy with the end result and we would definitely use Garage World Townsville again and recommend them to others." 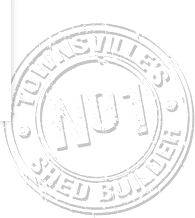 "My family have had many garages built by Garage World Townsville, and I didn't hesitate in using them on my first home build project. They offer a quality product, a great management team and they delivered on their promise. I will be happy to use them again." "We waited 5 years to get our double carport and boy, did we shop around! Our decision to use Garage World Townsville really came down to the professionalism and quality of the product. Nathan really looked after us and we had a pleasant experience right through the project. It was so easy." "I was very happy with the finished product of my shed, and as a retired plumber, I didn't have to go over the whole job and check on things. I couldn't fault them on quality or customer service." "My experience with Garage World Townsville was easy, it met our expectations and were a professional organisation. Their word means something which is rare these days."